An article published in the journal “Science” describes a study of the galaxy W2246-0526, the brightest known. A team of researchers used the ALMA radio telescope to examine it by uncovering streams of materials as they are stripped from three smaller galaxies orbiting it. In one case a “tidal tail” is generated, a large stram of materials that connects W2246-0526 with one of its satellites. According to an article published in “The Astrophysical Journal” the supermassive black hole at its center has a mass that’s about 4 billion times the Sun’s. The galaxy W2246-0526 has a brightness estimated at about 350,000 billion times the Sun’s due to its quasar nature. At its center a supermassive black hole is heating the materials attracted around it to the point that they emit electromagnetic radiation. The infrared ones, very intense, led to its discovery by the NASA’s WISE space telescope, in fact its full name is WISE J224607.57-052635.0. The supermassive black hole feeds what’s called a quasar, which in this case has an extreme activity of a type called Hot DOG (Hot Dust-Obscured Galaxies), a particular category of hot and dust-filled galaxies that absorb most of the electromagnetic radiation. The mass of that black hole is estimated around 4 billion times the Sun’s, really huge even for that type of objects, yet the researchers estimate that it should be three times greater to generate those electromagnetic emissions. Apparently there’s an inconsistency in what astronomers are seeing and for this reason further observations will be needed. Tanio Díaz-Santos of the Universidad Diego Portales in Santiago, Chile, the first author of this research, has been studying the galaxy W2246-0526 for some time with the ALMA (Large Millimeter/submillimeter Array) radio telescope, inaugurated in March 2013. At the beginning of 2016 he and his team reported the turbulent activity in that galaxy, which reaches such levels that the gas ends up being ejected with the consequnce that there’s a strong suspicion that inside it star formation was interrupted. The situation is quite complex because the galaxy W2246-0526 is also stripping materials from three dwarf galaxies close to it. 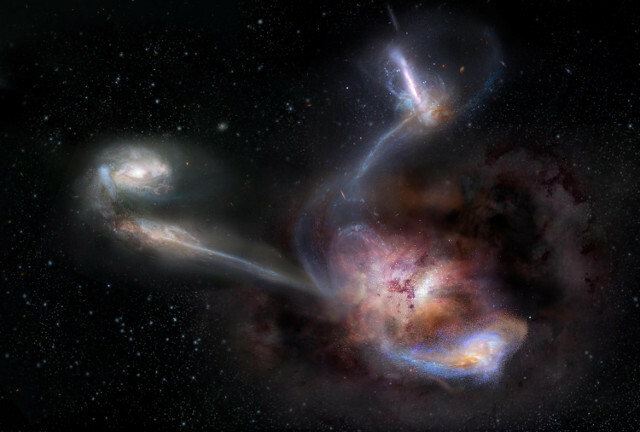 They were already detected in the past but only recently the power and sensitivity of the ALMA radio telescope allowed to detect the streams that connect the various galaxies. 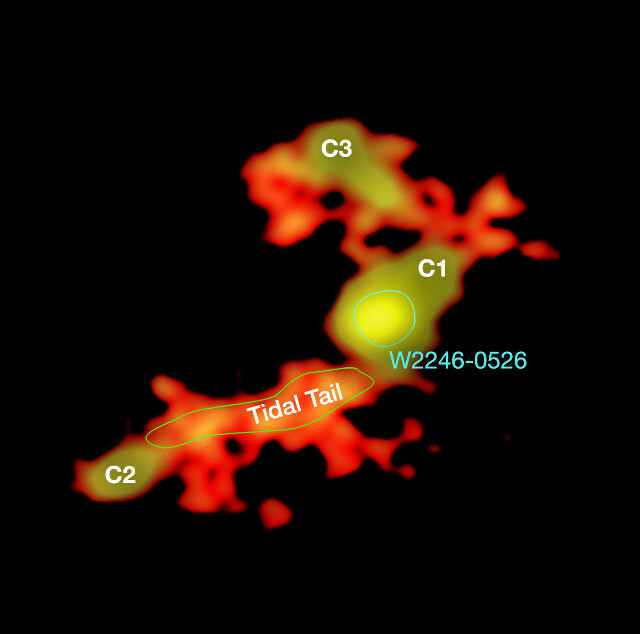 The top image (T. Diaz-Santos et al., N. Lira; ALMA (ESO/NAOJ/NRAO)) shows precisely that situation with the dwarf galaxies referred to as C1, C2 and C3, various streams that connect them and in particular the large tidal tail that connects it with C2. The bottom image (NRAO/AUI/NSF, S. Dagnello) shows an artistic version of that group of galaxies. One possibility is that the galaxy W2246-0526 is typical of the Hot DOG category but it’s also possible that other galaxies of that type absorb materials such as intergalactic gas clouds that are difficult to detect at great distances. In this case, the distance is about 12.4 billion light years so we see it as it was when the universe was very young in astronomical terms. This means that we’re seeing it in an early phase of its evolution but in the meantime it’s possible that it devoured its small neighbors. The WISE space telescope allowed to discover other Hot DOG galaxies but the galaxy W2246-0526 is almost twice as bright as any other known galaxy. It could be in a key phase of its evolution and this could explain a behavior that’s extreme even for that type of objects. The influences on the galaxy’s evolution and therefore also on star formation are the reasons why there are so many studies on supermassive black holes’ activity and we can expect them to continue for a long time.